What an amazing bunch of women. I guess practice does make perfect, and that using a drop spindle to spin from a very young age, with your peers for a bit of friendly competition, makes one rather proficient. I couldn’t imagine being able to spin with a drop spindle that quickly, and I have tried it. The wheel is just so much quicker, although my collective two hours worth is admittedly not nearly enough practice to become even mediocre. This photo appeared in one of the Spin Off magazines. I just love the contrast of the old and the new in this picture. 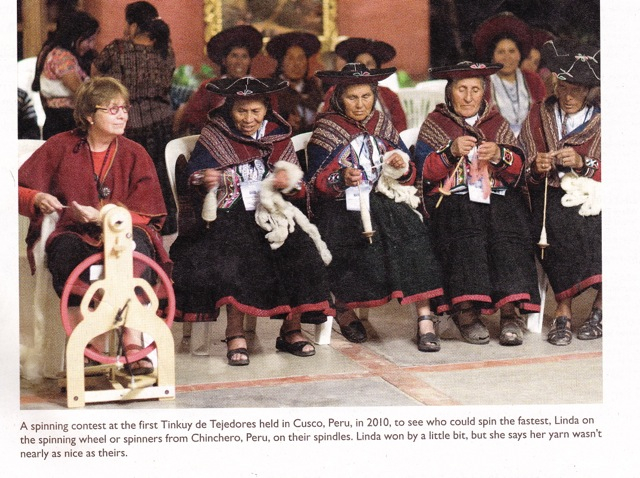 And yet the Peruvian women in their traditional dress with spindles share a sort of kindred relationship with their Western counterpart with her modern clothes and very modern spinning wheel, via their skill in such an ancient textile art.